What Else can I Expect from an Online Bachelor's in Project Management Program? The demand for professionals able to manage complex projects has increased. That's reflected in the lucrative pay for project management professionals. According to Payscale, the median salary for a project manager is $71,259. Graduates can earn a six-figure salary as they accrue experience. In this guide, you'll find information related to salaries, careers, and what considerations you should keep in mind as you explore project management programs. In a typical project management degree online program, students will learn how to manage time, people, and resources effectively to help departments and organizations run efficiently. Many programs contain core courses that cover common business topics like leadership, principles of management, marketing, and accounting. Some online project management degree programs allow learners to choose a concentration, which often focus on a specific industry. Concentrations often include topic areas like healthcare management, information technology management, and computer networking. Some programs do not offer specializations, choosing instead to provide a broad overview of project management and how it can be applied in different fields. Project management online degree bachelor programs also differ in whether they allow or encourage students to minor or double major in related business subjects, like accounting or international business. With over 130 locations around the world, Embry-Riddle Aeronautical University Worldwide is dedicated to making higher education accessible. The school was among the first in the nation to offer online learning opportunities, instituting its first distance learning courses in 1971. ERAU’s online courses last nine weeks and have multiple start dates throughout the year. ERAU’s online project management degree curriculum is designed by its Project Management Professional (PMP) certified faculty. Students have the opportunity to become PMP certified, which can provide an advantage when it comes to earning potential. Students are required to earn at least 120 credits to graduate. Learners complete 21 credits of open electives and core and major courses. Core courses include business statistics, corporate finance, principles of management, and leadership. ERAU also sets itself apart by offering a 4+1 option. This option gives students the opportunity to complete a master's degree within a year of completing the bachelor's program. The CSU-Global Campus is committed to providing low-cost, high-quality education to online students. Online classes are taught in an asynchronous format and are accessible 24/7. CSU-Global’s project management online degree bachelor program prepares students to take the Project Management Professional certificate exam, and its curriculum is aligned with the Project Management Institute’s body of knowledge. Students can choose between more than 20 industry specializations, like public and nonprofit management, computer programming, and healthcare management. Core courses include applying leadership principles, introduction to project management, project leadership, and total quality management. Learners must complete a capstone project. CSU-Global offers monthly program start dates. Online courses are taught in an accelerated, eight-week format, and every class is offered each term. The school has a tuition guarantee; once online students enroll in a program, their tuition rate is locked in as long as they maintain continuous enrollment. Located in Lynchburg, Virginia, Liberty University offers more than 250 online programs. Many of the online courses are taught in a flexible, accelerated, eight-week format. All of Liberty's programs are taught from a biblical worldview, where students are taught how to integrate faith and learning. Liberty offers a bachelor of science in business administration--project management, which can be completed entirely online. The school’s project management program consists of 120 credit hours. At least 30 credit hours must be taken through Liberty, 27 of which must be major hours. Transfer evaluations are free for students considering Liberty, and the school may also grant credit for prior work and life experience. Liberty views its project management program as preparation for a master’s in business administration, which the school offers online. As a military-friendly school, Liberty offers significant tuition discounts to military members. With over 80,000 online students, Southern New Hampshire University is expanding the boundaries of higher education. The school has six online terms per year, with courses lasting eight weeks. SNHU allows students to transfer up to 90 credits from other institutions. SNHU’s BS business studies in operations & project management is designed for professionals looking to advance their career. The project management degree online program provides an overview of operations and project management and how the two disciplines intersect. The program also prepares students to take the PMI’s certified associate in project management (CAPM) certification exam. Students must earn at least 120 credit hours to graduate. SNHU boasts some of the lowest tuition rates in the country and offers an additional 30 percent tuition discount rate to active-duty service members and their spouses. BU, located in Bellevue, Nebraska, offers affordable, accredited, career-focused online programs. The school's online degree in project management requires students to earn 127 credits. The program is accredited by the Project Management Institute Global Accreditation Center for Project Management Education Programs (GAC). The program is also approved by the Program Management Institute. BU’s project management program is offered in a cohort format. This means that groups of students will move through the program together, establishing a sense of camaraderie and community online. In addition to general credits, major credits, and elective credits, students must also complete nine credits through the Kirkpatrick Signature Series. The series comprises courses that guide students to examine their roles and responsibilities as citizens. Core courses include business communications, project quality, project cost, and project leadership. Boasting 20 locations in the Northwest and 30 online bachelor programs, City University of Seattle caters to working professionals and transfer students seeking career advancement. At CUS, students can pursue a bachelor of science in project management that’s offered completely online. The program requires students to earn at least 180 credit hours, and the school accepts up to 135 transfer credits from another institution. Students earning the project management online degree have the option to pursue a specialization in information technology or create their own. As a registered education provider with the Project Management Institute, CUS offers courses that fulfill educational requirements for PMP certification. Courses are offered in an asynchronous format and delivered through Blackboard. CUS offers tuition discounts to active-duty service members and employees of the Department of Defense. Minnesota State University Moorhead’s bachelor of science in project management is one of the select online project management degrees to earn accreditation through the Global Accreditation Center (GAC). The program is also offered as part of MSUM’s 2+2 program, which allows students to transfer over their AS or AAS degree. Students are encouraged to take up to 30 credits in their area of interest. Students are also encouraged to pursue a minor or double major in conjunction with their project management degree in subjects such as global supply chain management or professional selling. The bachelor’s degree is offered as an “online plus” program, which means that courses are offered fully online with the option to take some classes on campus. In addition to a bachelor’s degree in project management, MSUM also offers a minor in project management and a project management certificate that prepares students to take the Project Management Institute’s CAPM exam. Malone University, located in Canton, Ohio, is a Christ-centered institution of higher education. Students who want to earn a project management bachelor degree online may be interested in MU’s project management program for its flexibility. The major is offered as part of MU’s accelerated degree completion program. Students can finish the program in 12 months. Each program is personalized, and students can choose to dual major in related subjects like marketing management and environmental management. Students will graduate with a bachelor of arts in organizational management with a major in project management. MU boasts a management mentor network for prospective and current students. Learners are paired with a mentor who can provide advice and career guidance specific to the challenges they face. Graduates are prepared for careers in information technology, telecommunications, financial services, and more. With campuses across Michigan and online, Davenport University is able to serve over 9,000 students. DU’s bachelor of science in technology project management prepares students for in-demand management careers within the technology sector. The school’s tech-focused project management online degree bachelor program requires 120 credit hours and can be completed entirely online. Once core coursework is completed, students choose a specialization in one of six areas: accounting information systems, computer information systems, health information management, information security, networking, or a professional focus. The professional focus speciality is designed for transfer students who have already completed credits in one of the focus areas. DU prides itself on its transfer-friendly policies; the school commonly accepts transfer credits from community college, college-level, and occasionally even high school courses. All courses are taught by PMP certified faculty. The University of the Incarnate Word is a private, Catholic institution with campuses throughout Texas. Students can pursue a bachelor of science in business administration with a concentration in project management. Courses in the project management bachelor program are eight weeks long and offered during six terms throughout the year. Classes are taught asynchronously and include project management methodologies, project planning, and total quality and lean management. The program requires 120 hours to graduate, 45 of which must be completed through UIW. Students are required to complete at least 45 hours of community service. The school also strives to make its online degrees as affordable as possible; UIW claims that its tuition is approximately 50% less than traditional private schools. Undergraduate students receive free textbooks, and veterans are eligible for special benefits. For students seeking a project management bachelor degree online, understanding program details is crucial for choosing the right program and determining whether project management is the right field of study. Keep in mind that details concerning curriculum and program length will vary from school to school. Your project management online degree will cover a wide range of business topics and issues related to project management. While courses will vary, you can view a sample curriculum below. Project Scheduling and Control: Students will learn techniques and best practices for scheduling major projects with many moving parts. The course may cover how to monitor project progress, common scheduling tools, and how to identify and recommend actions if a project starts to veer from its course. Contract Management: A major part of project management is procuring and managing project contracts. In this course, students will be introduced to the essential elements that make up contracts, including vendors, purchasing, and legal considerations. Health Information Management: Common topics covered include how to handle patient data and keep it secure, personnel needs, contracting with vendors, and systems theory. This course helps prepare future project managers for careers in the growing healthcare field. HOW LONG DOES IT TAKE TO GET AN ONLINE BACHELOR'S IN PROJECT MANAGEMENT? A typical bachelor's degree in project management will take two years, or approximately 120 credit hours, to complete. Of course, the time it takes you to complete your online degree depends on several factors. Some project management programs boast generous credit transfer policies, so you may be able to transfer credits from a two-year degree, other college courses you've taken, or even work or military experience. Some programs are designed for working professionals who hold an associate degree. These programs can be completed in one year. The format of a project management program will also affect the length. If a program is asynchronous, you will be able to work through the program at your own pace, perhaps allowing you to earn your degree more quickly. Alternatively, programs may be offered in a cohort format, where students work through the program together, according to a predetermined, set pace. The number of terms a school offers throughout the year -- some offer as many as six or more -- will also affect how quickly you can earn your degree. As you explore schools that offer project management degree online programs, it's important to pay attention to a school's accreditation. Accreditation ensures that a school has met a stringent set of standards, so you know you are receiving a quality education. You'll typically come across schools that hold one of two kinds of accreditation: national or regional accreditation. National accreditation usually applies to vocational schools or special programs. Regional accreditation is determined by six different regional accreditation boards across the U.S., and a degree earned from any regionally accredited school is valid in any state. Schools that offer online project management degree programs are most likely to be regionally accredited. The project management programs themselves may also be accredited by industry organizations. One accreditation to look for is the Project Management Institute's Global Accreditation Center for Project Management Education Programs (GAC). This accreditation is earned by programs that adhere to PMI's comprehensive global standards. Two organizations help determine which schools earn accreditation: the U.S. Department of Education (DOE) and the Council for Higher Education Accreditation (CHEA). The secretary of the DOE approves accreditors, and any school that wants to receive federal grants must be accredited. The CHEA is a self-regulating organization that advocates on the behalf of accreditors and accredited schools. They also provide information to combat “diploma mills” -- schools that provide a low quality of education and are only interested in churning out degrees to make money. You can find lists of accredited institutions on the DOE's and the CHEA's website. There is a demand for project managers in a variety of industries, making it a lucrative career path for students. An industry report from the Project Management Institute reveals how gaining skills in project management can fast track you to career success. According to PMI's survey of project management professionals, the average salary of a project manager in the U.S. is $108,200. Many factors influence a project manager's earnings, including experience, project size, and work location. One major factor affecting earnings is whether a project management professional holds a Project Management Professional (PMP) certification. Professionals in the U.S. who have earned this certification make, on average, 22% more than those who don't. 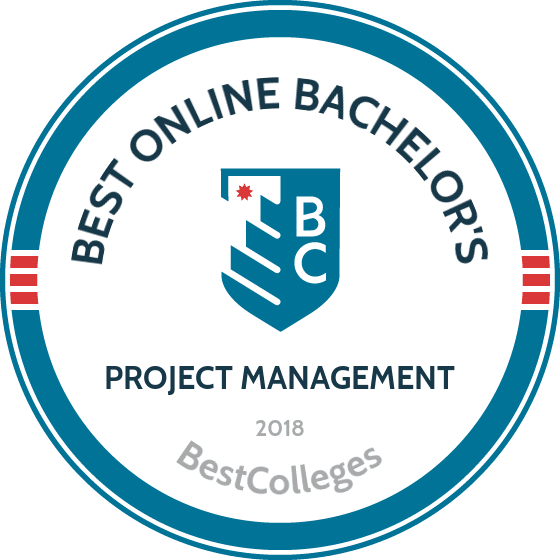 This is good news for individuals interested in enrolling in a project management online degree bachelor program, since many programs explicitly state that they help students prepare to take PMI's certification exam. In addition to individual workplaces, professional experience level will impact the annual earnings of employees in the project management field. The next table features data from PayScale regarding expected salaries for different types of project managers and related jobs at different stages of their careers. Computer and Information Systems Managers: Often called IT Managers, this type of project manager plans and coordinates the computer-related needs and activities of an organization. This job field is expected to grow faster than average -- by 15% between now and 2024. Construction Managers: Working from the office and in the field, construction managers plan, coordinate, and direct construction projects. Entry-level construction managers typically hold a bachelor's degree. Engineering Managers: Engineering managers direct activities at engineering companies, working from their offices with occasional visits to the field or labs. To get started in the field, engineering managers need at least a bachelor's degree and some experience in engineering. Health Services Managers: Sometimes called health care administrators, health services managers are in charge of coordinating medical and health services in healthcare organizations. They must be up to date on healthcare laws and regulations to ensure compliance. Emergency Management Directors: Emergency management directors are in charge of preparing for natural disasters and other large scale emergencies. They also need to keep the public informed about how emergencies are being handled and often must coordinate with government agencies and public officials. Graduates and students of project management programs should explore the many professional organizations in the project management field. These organizations provide opportunities for continued learning in project management, including access to other professionals in the field and to recognized certifications. Some organizations also sponsor contests, where professionals are honored and awarded for their achievements. The Project Management Institute provides industry-leading certifications as well as education and mentorship opportunities. It also provides accreditation and content guidelines for project management programs. The International Project Management Association connects project management professionals around the world with research, community opportunities, awards, and more. The American Management Association offers online training for management-related issues and books, podcasts, and seminars. It also hosts a Women's Leadership Center. When figuring out ways to pay for your online project management degree, it's important to remember that funding can come from a variety of sources. Your first step in figuring out how to pay for your degree is to complete the FAFSA form, which will help you understand what federal funding opportunities are available to you, including grants, scholarships, and loans. Sometimes, large organizations may help cover the cost of continuing education for its employees. If you're pursuing a degree in project management to further your career with a company, explore any ways they might be able to help you cover the cost.